It’s Career Week at Bayport Elementary, and Frank and Joe’s school assembly turns up some interesting guests. One student’s uncle is an animal trainer who brings a chimpanzee. 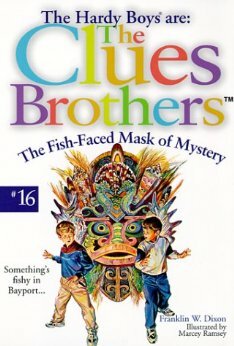 Another girl’s father is an anthropologist who brings in a mask decorated with feathers and shells from a Pacific island. But when the assembly is interrupted by a fire drill, the mask is stolen—and the Hardys spring into action.